If you're like me, the last few days have been spent doing your best to cool off. We're in the midst of a heat wave in this normally cool city, so I went to my kitchen full of fresh fruit and put together the perfect cure. 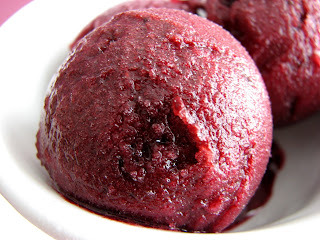 Imagine the deepest magenta sorbet full of the freshest blueberry flavor combined with the earthy richness of a good red wine and the slight subtle backnote of spice. What you get is a light and refreshing cold slush that will leave you more than satisfied after a light summer meal. Or even after a substantial grilled menu, come to think of it. 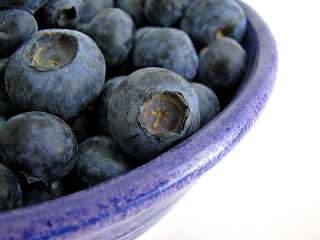 Blueberries are the treasured fruit of a healthy diet and are found in abundance just about everywhere. As the temperatures rise this season, ice cream, sorbet and granita seem the perfect antidote. There are dozens of fabulous recipes full of wonderful ingredients to try, so let’s get started! - Crème de cassis is a wonderful liqueur made from black currants in the Burgundy region of France. I use Chermette. 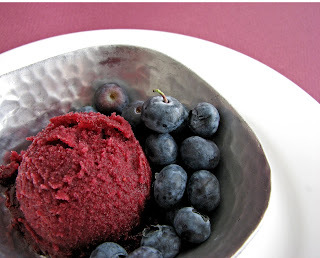 The liqueur lends a bit of sweetness and a rich berry depth to the sorbet base. Crème de cassis was originally produced by 16th century monks as a cure for disease and wretchedness. Incidentally, it is the favorite drink of Agatha Christie’s fictional detective, Hercule Poirot! - I sometimes throw a sprig of rosemary in the simmering wine. It adds a delicious herbal backnote. Combine wine, water, sugar, vanilla bean, cassis, lemon juice, cloves and peppercorns in a large saucepan over low heat. Simmer for about 25-30 minutes. Strain out the spices and vanilla bean. Cool. Blend some of the liquid and blueberries in a food processor or blender until blueberries are smooth. Pour into a fine mesh strainer placed over a large bowl. Keep processing in batches until you have the entire mixture liquefied and strained. Taste for more lemon juice. Chill in covered container overnight. 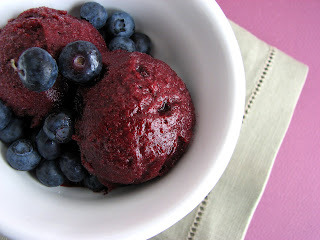 Freeze the blueberry mixture in your ice cream maker. Pour into a container, cover the surface with a piece of plastic wrap and place the lid on tight. Place in the freezer to firm up. The stone fruits are so abundant this year, and delicious. This sounds like just the trick for the string of 90 degree weather we're in store for next week. Like the flavorings, spices you used. If I don't have an icecream maker. Can I just put it in my freezer?? Some people also recommend using an immersion blender or regular blender to incorporate some air and keep it smooth. I like ice ream.I had never tested Blue bery ice cream but now i will definitely test it. Is this heavenly or what! The color is just beautiful! I can just see my self sitting and eating this on a hot summer evening, wonderful! I tried making your sorbet recipe without an ice cream maker, and although it has been in the freezer for more than 24 hrs, it is still quite slushy, and not completely frozen. I followed the recipe almost exactly except for the fact that I added a tad more wine (I poured in the whole bottle). Do you think I have too much alcohol in there? Is there any way to make it freeze better? Or should I just keep waiting? Other than the fact that it's slush rather than sorbet, it tastes delicious! Thanks for your help, and thanks for the recipe! Hi Polina. The sorbet never really gets super hard because of the wine, but sorry you had a slushy outcome. The weird thing about sorbet, is that the ratios need to be kept fairly close. A whole bottle of wine is more than 3 cups, although it shouldn't throw it off that much (750 ml = 3.17 cups). Did you by any chance also increase the sugar? That would also prevent it from freezing. You could try adding a bit more water without diluting the flavor too much and refreezing. Unlike ice cream, you can refreeze sorbet without risk. Hope this helps! This looked too intriguing not to make! Although I had similar problems with it not freezing, and I did use and ice cream maker. The only thing that I can come up with is that when I was simmering all of the ingredients together, it may not have gotten hot enough, where it may have burnt off some of the alcohol.. I also noticed that the wine flavor is very strong, and I might try adding more blueberries next time.